Wow – what full and fun days at my Artist-in-Residence! The past week has seen many visitors to the SAORI Salt Spring Studio. 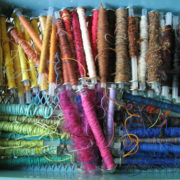 My son and dil (Tom & Tanya) were here for a lovely week of weaving, sewing, visiting and excursions. Also Mami visited for 3 days from Montreal, Tara has been here twice, Lynn was able to visit again, Elizabeth, from Portland, came by to see what SAORI was all about, and Teresa picked up her new SAORI SX60 4 harness loom – and more visitors have planned to come in the next while. Mami visited with Tara, Lynn and I and we talked a lot about SAORI. 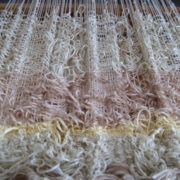 She shared some of the things that she has woven and she also completed a 6 metre weaving to make into more clothing. With Mami and Lynn we had a mini SAORI kai – which was inspiring! I forgot to take many pictures, but I have many memories! And of course more weaving was done and new warps made and much good gluten-free, sugar-free food was shared! AiR Day 3 - Does time exist? It seems that your artist-in-residence program has been very successful. How nice that so many friends and family were able to join you for weaving and other things! Judging by the picture of you with your son and DIL, you must have been ten years old when you had him. 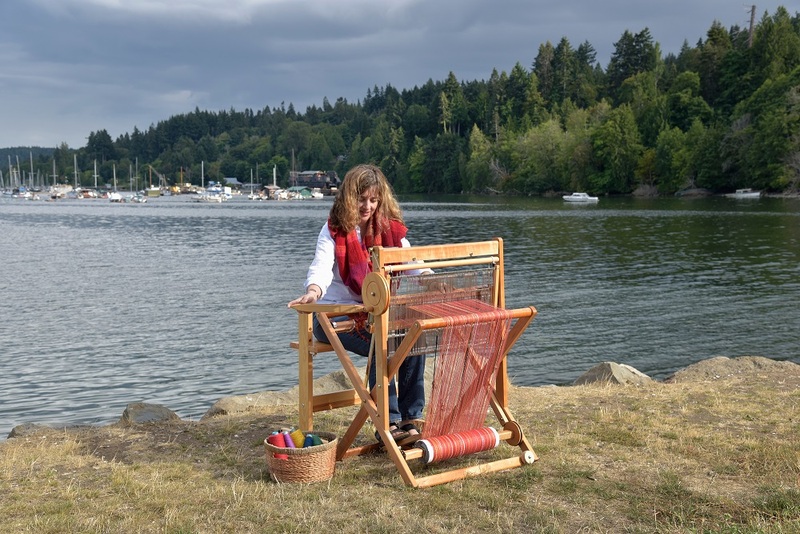 Thanks Judi – yes it has been so much fun and great to share SAORI with friends & family and to meet new people through the studio and SAORI weaving! It is amazing to me the number of opportunities that have come up this month! And thanks for your comment on the photo with my son & dil – haha! What a great picture of the 3 of you! And the hawk and owl….simply awesome, literally. I’ve been there a couple of times, but never on one of the walks. It was inspiring to have a visit with you and Mami, I came home with so many (more!) ideas. I could do that once a week!! It was so awesome to do the Hawk Walk – I cannot say enough about it and how it felt. I was full of awe!! Wonderful to have you here at the studio as always – and thanks for the fabulous food your brought. Once a week sounds good to me – how can we arrange that?? Certainly easier in the summer months with the longer days……hmmmm…..
I’d like to have a SAORI Kai soon – as it is so inspiring to see what others are doing and get new possibilities. I like what Kitty and Michael said about inspire – breathing – breathing life & creativity. AiR! !